I got a notification last night and I was surprised that it hasn’t been longer. 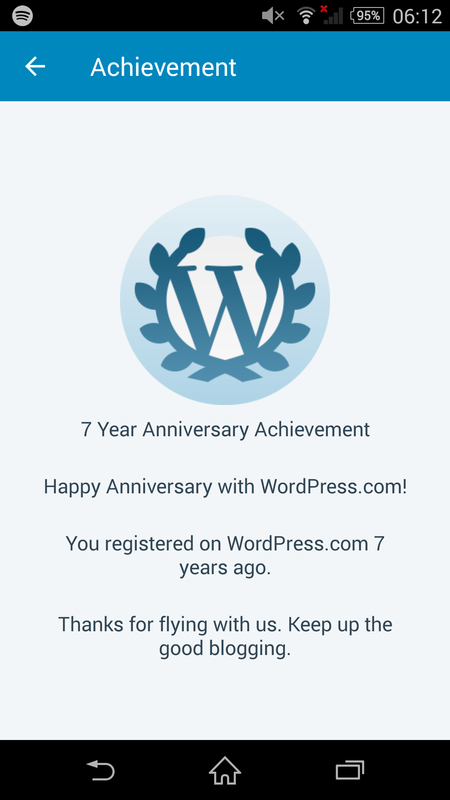 Though I’ve ‘only’ been blogging for 3 years, I’ve been wanting to blog since 2007/8, dipping my toes countless times before scrapping everything. I hold back. I’ve always enjoyed being the invisible observer, not the observed. Existential angst forced me out of the shadows. I have so much I want to write about, but I abort every idea before they can take on life, simply because I …I don’t know why. I don’t know why I hold back 90% of what I want to share and write about here. This blog is my home. I don’t even picture people reading it, I’m content just ushering pieces of me into the light. In my darkest moments when waves of self-doubt tower over me I can hold on to the fact that some pieces of me escaped the ether of my mind, and onto this blog. But it’s an arduous and painstakingly slow process of excavation and extraction. I guess I prefer not going through with it because once I see what I’ve extracted from my inner world, my outer world would change. For most, being recognized and fulfilled is an amazing thing but for me it only entails one thing: loss of safety. The obscurity is like a warm blanket I snuggle up to on wintry nights. If I don’t show up then people won’t be attached to me and if they aren’t attached they won’t have expectations and if they don’t have expectations I don’t have to disappoint them and if I don’t disappoint then I could pretend that this toxic shame I carry doesn’t exist. I can pretend that if I wanted to, I could come out of hiding and I’d be loved. I know this is false, but I’d rather bury my head in the sand than discover a devastating truth. If I don’t try I can’t fail. If I don’t live I won’t fear death.